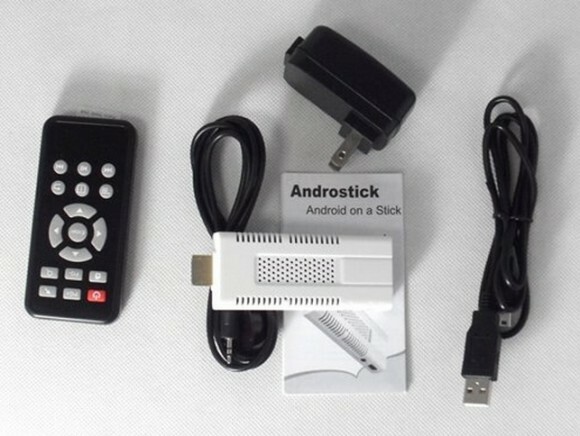 This new Android on a stick computer is named Androstick and it is reasonably priced at U$S 78 on chinese Aliexpress website. The Androstick might be seen as an evolution on Android sticks, as it includes a remote control, a truly welcome addition to the concept. This tiny Android computer might be directly plugged into the HDMI port of your TV as it has an HDMI male port protruding from it. From the other side, the Androstick includes an USB 2.0 OTG connector which might be combined with an USB Hub in order to connect an USB keyboard and mouse to it, which seems to work just ok, according to some reviews. The Androstick is based on an ARM Cortex 9 architecture. Although on the seller’s webpage is said to be running at 1Ghz, the real clock speed seems to be 800 mhz, according to some comments from different buyers. The Androstick includes a Mali 400 graphics co-processor, allowing it to cope with 1080p resolution. On the memory side, the Androstick has 512mb of available RAM to run your Apps and Games. It also includes 4Gb of Flash Ram. The infrared sensor, used to read your commands issued by you from the remote control, is external and includes a cable in order to be conveniently placed. Remember that infrared signals needs an unobstructed path from the remote control into the sensor. A bit of bad news: The Androstick is not rooted, out of the box, so until you get a way to gain superuser access into it, you might deter from using any app requiring root permissions.